Da Capo Lifelong Books, 9780738214337, 352pp. Mark Reinfeld, founding chef of the celebrated Blossoming Lotus Restaurant, has been preparing inspired vegan and live food cuisine for more than fifteen years. His Vegan Fusion World Cuisine has won nine international awards, including a Gourmand Award for Best Vegetarian Cookbook in the USA.” He is also the author of The 30-Minute Vegan and The 30-Minute Vegan's Taste of the East. "From one compassionate recipe to the next, this globetrotting culinary tourdeliciously melds the flavors and aromas of the Old World with modern vegan sensibilities." "These quick and tasty recipes are ideal for anyone who wants to transition to a vegan diet...without knowing it!" "The classic dishes of Europe used to seem 'above and beyond' either my culinary talents or the parameters of plant-based fare, but The 30-Minute Vegan's Taste of Europe changes all that. Mark Reinfeld has created a culinary treasure trove, even masterfully veganizing the scones I learned to love as a student in England. Imagine it: tea time, with no compromises." “With Mark Reinfeld’s guidance, anyone can produce impressive and delicious vegan meals. 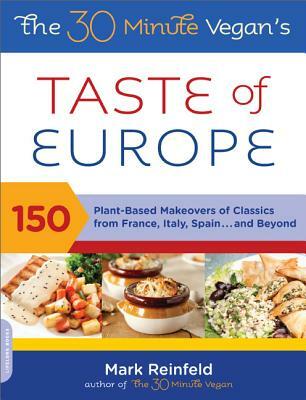 Sure to become a classic of healthy and humane cuisine, Taste of Europe is packed with easy recipes that will appeal to vegans and meat-eaters alike." “Mark Reinfeld takes compassionate cooking to a new level with these incredible recipes. Taste of Europe makes vegan meals accessible to everyone—and is the perfect cookbook for when you want to impress your meat-eating friends."